The folks behind the 30 Years of Garbage documentary released the official trailer for the film today. The film started by producers June Gonzales, Joe Simko, and Jeff Zapata is nearing the finish line after it was first offered as an Indiegogo.com project over 18 months ago. The documentary is aiming to cover the 30 years of Garbage Pail Kids history. From the inception of the card line, to the Garbage Pail Kids movie, to controversies surrounding the cards, and even showing off some of the huge GPK collections around the world. Many artists, actors, and super fans were interview for the film. The film does not yet have a release date, although the producers have mentioned a June/July timeframe for the release of the DVD. They also said a date for the World Premier located in New York City would be announced soon. 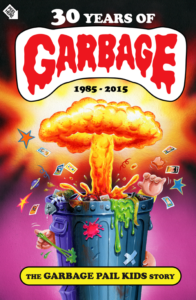 To keep up to date on 30 Years of Garbage visit their Indiegogo page. 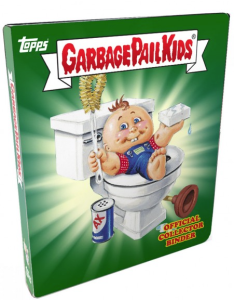 Topps today released six new Garbage Pail Kids Collector’s Binders. They are doing things a little differently this time around. 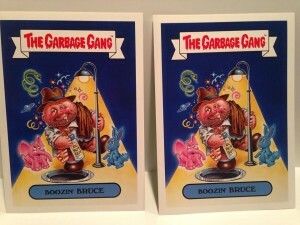 First off, Topps continued their GPK binder series and released binders 17-20 (17-Dead Ted, 18-Scotty Potty, 19-Brainy Janie, 20-Up Chuck). Topps announced that binders 17-20 are limited to 100 copies each, with a cost of $19.99. 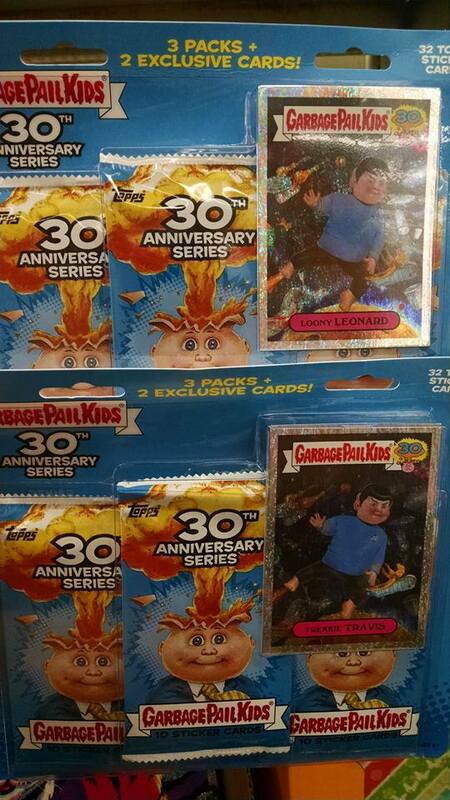 Additionally, Topps released the anticipated 30th Anniversary binder, coming in two variations. 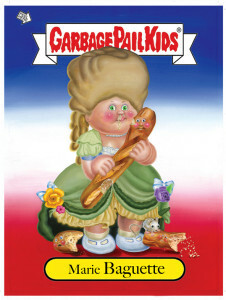 The Pink Adam Bomb 30th Binder comes with Promo card “Let Them Eat Kate”, while the Blue Adam Bomb 30th binder comes with the Promo card “Marie Baguette”. The 30th binders look to be limited to 400 copies and cost the same $19.99. Head over to Topps online shop to order yours now. 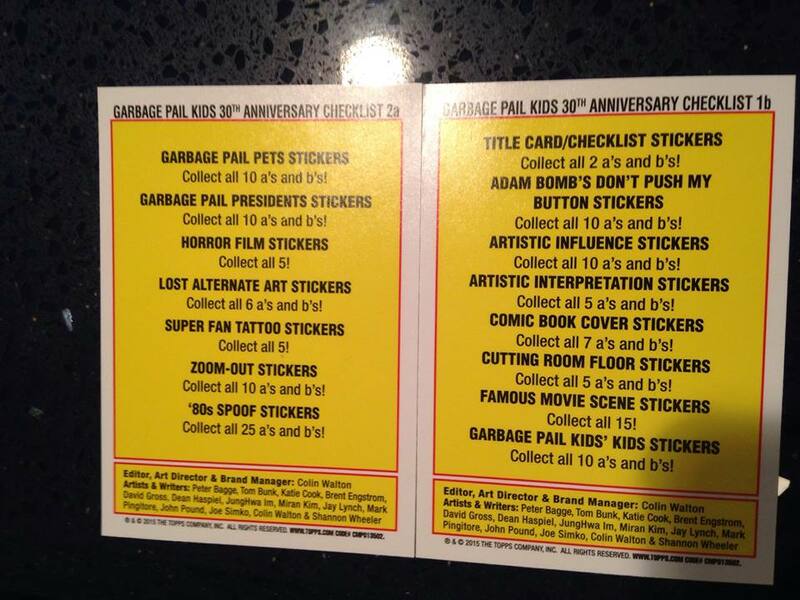 This is Part 2 of a study on how large the print run was in the Garbage Pail Kids 30th Anniversary set. If you missed part 1 you can go here to get caught up. 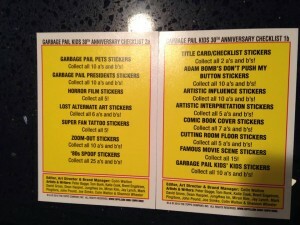 In the first article, based on information from the odds and sell sheets, I wrote about how many packs/boxes/cases were made for Hobby/Collector/Retail for the GPK 30th set. We have 577,000 Retail Packs + 51,000 Hobby Packs + 41,000 Collector Packs = 669,000 Packs. I’ll be using those numbers to attempt to figure how how many of each card/parallel were made. This can give you a good idea how tough a set will be to put together or how rare that last card you need for your rainbow is! As a reminder I had to use some educated guesswork and assumptions to come to these numbers. But I’m pretty sure we are in the ballpark. So how many of each card was made? We aren’t able to answer this for all cards. Some of this is easy, Topps gave away this information on the sell sheet! According to the sell sheet there are 384 Italian Stamp Relics, 500 Die-Cut sketches, 19 Pen Relics, 15 total Triple Autos, 40 total Duel Autos, etc. Other card types are impossible to figure out because not enough information is provided. For example on the retail side its not possible to determine how many Wal-Mart Blue parallels there are, or how many Poop-allels there are. While we know how many retail packs were made, we don’t know the break down between Gravity Feeds, Blasters, Jumbo, regular retail boxes, and Wal-Mart packs. We can only figure out print runs for things that have the same odds across all pack types or items in Hobby/Collector boxes. Medallions: 41,000 Packs / 92 Odds = 445 total medallions / 6 = 75 of each medallion made. So at most only 75 collectors will have a set of these. Barf Bags: 1708 Boxes / 1 per box (duh!) = 1708 total Barf Bags / 10 = 170 of each bag made. Artist Relics: 41,000 Packs / 28 Odds = 1464 total relics / 4 or 5 (Its tough here because there are no odds for the “celebrity relic” so is it already part of the relic odds or is it separate? We don’t know.) = 366 or 292 of each relic depending on if Goldburg is included in the odds. Let’s get Hobby boxes into the mix here as well. 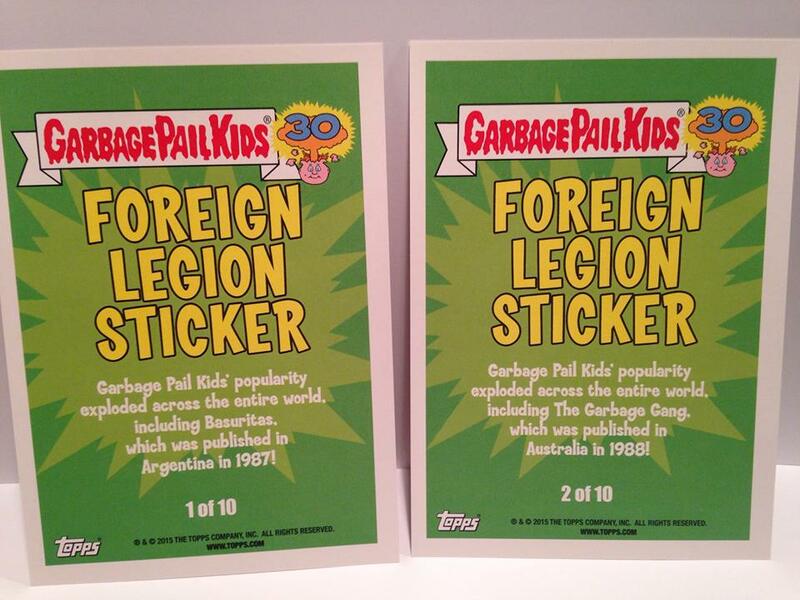 How many of the popular Foreign Legion cards are there? 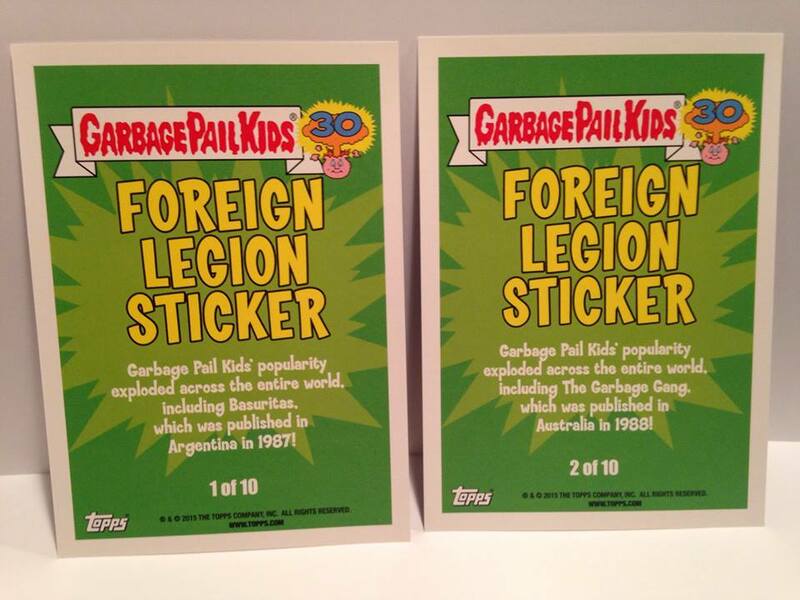 Foreign Legion: 92,000 total packs / 24 odds = 3833 Total Foreign Legion cards / 10 = 383 of each Foreign Legion card made. Now let’s grab all the odds and see how many parallel cards and the common inserts were made. 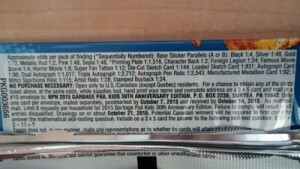 Remember due to Topps confusing wording on packs, listed pack odds are actually 1/2 of what’s printed. I’ll be using the real odds in my numbers below. Also note when looking at these, the sell sheet says there are 85 copies of each Gold Border card. Sepia/Pink Border Cards: 41,000 packs / 24 odds = 1708 total / 220 = 8 of each card made, and that’s with me rounding up! I know this number is hard to believe, but unless Topps is completely lying on the odds for Collector boxes there are just not that many of these to be had. Get yours when you see it! Red/Character Back Card: 41,000 packs / 1 odds = 41,000 total / 220 = 186 of each card made. Silver Border Card: 92,000 packs / 24 odds = 3833 total / 220 = 17 of each Silver border made. Interesting numbers I think. I was shocked to see how some of the numbers came out. Now don’t take these numbers as gospel because like I’ve stated some guesswork and assumptions had to be used. But I think these general numbers are close to what’s really out there. I’d love to hear your comments on the numbers, and the method I used. If I’m off anywhere please let me know! Finally, can we figure out how man base cards were made? Not exactly, but I’ll make a guess. Collector packs have 3 base cards, unless a thick card is in the pack. Hobby/Retail have 8 or 9 base cards depending on number of inserts in the pack. Because of this, even using my rounded guesswork numbers its still not really possible. Let’s see what we come up with anyway. I’m going to use 8.75 base cards per Hobby/Retail pack and 3 base cards per Collector pack for my numbers. Base Cards: 41,000 Collector Packs x 3 cards per pack = 123,000 Base + (628,000 Hobby/Retail packs x 8.75 cards per pack) = 5,618,000 Base / 220 = Approx. 25,536 of each base card made. Plenty of sets to go around! 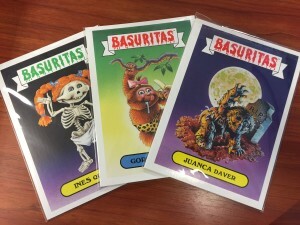 Thanks to GPK Collector Ke We for the Checkilist picture! 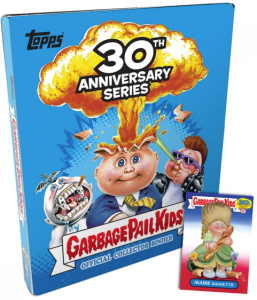 Topps decided to throw everything and the kitchen sink at the 30th Anniversary set this time around. Not only is there a record number of insert and parallel sets, but Topps decided to completely change the numbering for the base set. The base set is basically made up of individually numbered subsets. So, when searching ebay for your favorite character don’t use just the number, 1a will get you every 1a card for each subset. Let’s take a look at what we know so far. Base Set – 220 total cards, made of up 12 different subsets. Parallel Sets – Same exact cards from the Base set, except with a different color border or back. Insert Sets – These are all the various subsets Topps created for the 30th Anniversary set. I’ll continue to update this post as information comes in including Hobby pack odds. The rumors are true. 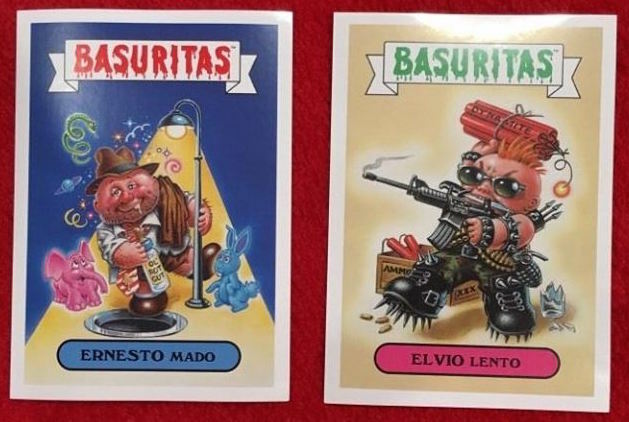 Thanks to GPK collectors Robert Smith and Raymond Ledesma who were some of the first to spot these special retail packs found only in Wal-Mart Stores. The packs come with 3 retail packs and 2 special cards. You will get 1 of 2 special foil parallels of either Trekkie Travis or Loony Leonard. You also will get a special blue border parallel card found outside the packs like the foil cards. It appears the Blue Borders come in all 220 base cards. 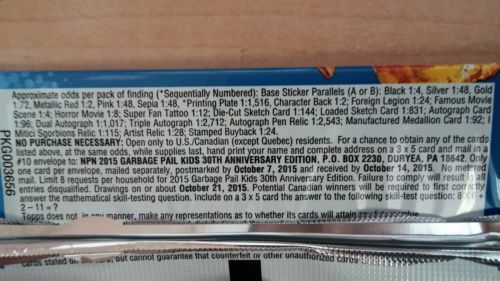 The odds on the back of the cardboard mention a special Blue Border “Character Back”. Are they referring to the blue borders found in the pack and just label it wrong, or does it mean there is yet another Blue Border Character Back waiting to be found? I’ll update this article should more information become available. 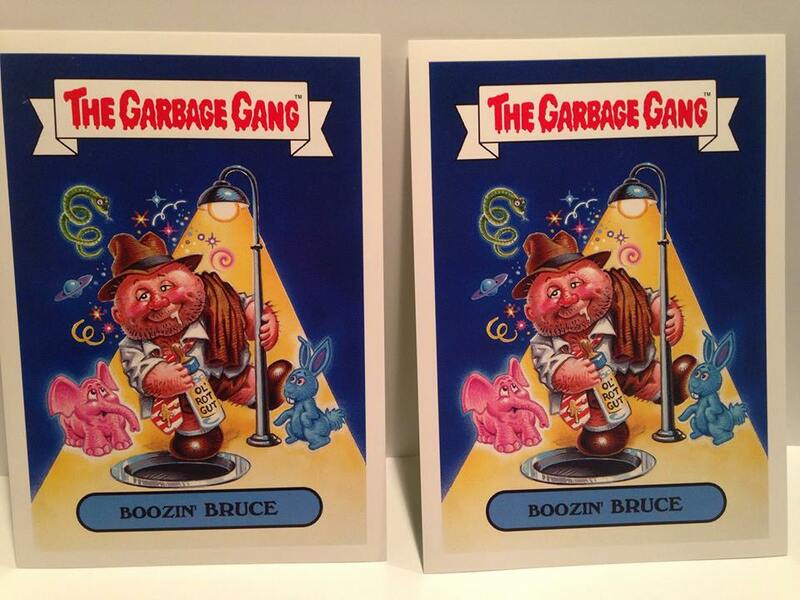 Thanks for GPK collector Nick Bulblitz for the confirmation. There are also Blue Adam Bomb Character Back Blue Border parallels inserted 1:21 in the Wal-Mart packs. These will be tough finds. So if we go with 880 plates we have 880 X 758 = 667,040 Total Packs in the print run. Wait a minute you say, “why did you use 758 when the odds are 1:1516.” Because the odds aren’t right, that’s why! (Assumption #2. Topps not only decided to confuse us on the numbering of the base set, but also on the odds. I believe the odds for the parallels are doubled from what is actual, here’s why. In looking at the pack odds closely is says “Base Sticker Parallels (A OR B):” Notice the “:” then goes on the have black, silver, gold, printing plate separated by “,”. Then there is a “;” before going on with the rest of the odds. I believe Topps is saying the odds of getting a Black Border are 1:4 for A OR B. Which really means 1:2 overall A AND B combined. This has to be true because all the parallels are falling at exactly half the pack odds in Retail, Hobby, and Collectors. Therefore I believe true printing plate odds are 1:758. So we are going to go with 670,000 total packs in the print run. That’s in between the number above. Now let’s try to figure out how many packs from each Retail/Hobby/Collectors. Collector’s is the easiest to find out. We just need to look at the odds for things that are only found in Collector Boxes. Let’s start with Duel Autos. According to the sell sheet there are 40 total, with odds of 1:1017. So 40 X 1017 = 40680 Total Collectors Packs. Let’s check with some other Collector only items. 15 Total Triple Autos X 2712 Odds = 40680 Total Collectors Packs. Look at that a match! 450 Total Medallions x 92 Odds – 41400 Total Collectors Packs. Ugh that’s close but off. 384 Total Italian Stamps X 115 Odds = 44160 Total Collectors Packs. Even more off. So why don’t the numbers add up? Who knows? As I mentioned above the odds seldom add up exact. Topps could have changed the amount of cards made for the items above from what they said on the sell sheet. It happens all the time, and by the looks of things they may have removed “C” names this time. I’m going to go with 41,000 Total Collectors Packs. Now let’s move to Hobby packs. We can figure out Hobby packs by looking at something only Hobby and Collector packs have, Die-Cut Sketches. The Sell Sheet says there are 500 total Die-Cut Sketches inserted in Hobby/Collectors boxes. 215 X 237 Hobby Odds = 50955 Total Hobby Packs, let’s just call that 51,000. Moving onto Retail. The only other thing that Retail shares with Hobby/Collector packs that we know how many total cards is autographs. The sell sheet says there are 3000 total autographs. 2364 X 244 Retail Odds = 576816 Total Retail Packs (This number means total 10 card packs. Which won’t be correct because some retail will be made of Jumbo packs, but the total number of autos in Retail would remain the same. So we have 577,000 Retail Packs + 51,000 Hobby Packs + 41,000 Collector Packs = 669,000 Packs. That is darn close to what we came up when using Plate and Gold odds. Here is what I believe to be the pack/box/case numbers for Hobby and Collector. What’s interesting about these numbers? I don’t think very much Hobby/Collector was printed. These could dry up within a few months. Retail? They printed a ton of it! It will be on store shelves for years. 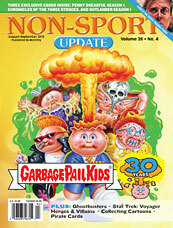 The August/September issue of Non-Sport Magazine is out, and it features Garbage Pail Kids 30th Anniversary! You can find this magazine at your local comic/card store, or you can order one directly from their website, http://www.nonsportupdate.com. 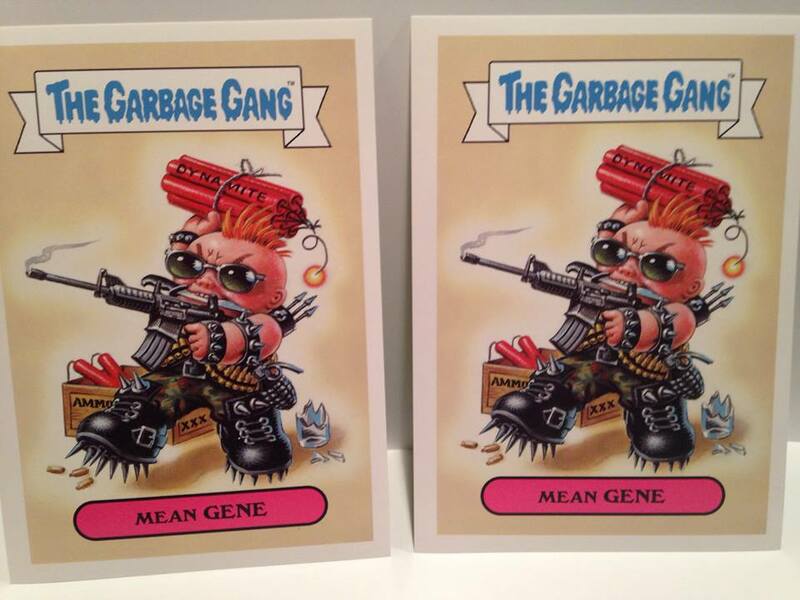 New Garbage Pail Kids Binders Incoming? Thanks to GPK collectors GGG and Keith Liddell they uncovered some interesting information on the website of one of the new artists for the GPK 30th set. Miran Kim who created the Trekkie Travis/Loony Leonard card for the 30th set also has another GPK painting on their site, http://mirankimart.blogspot.co.uk. There is a painting for an unreleased GPK, “Marie Baguette”. 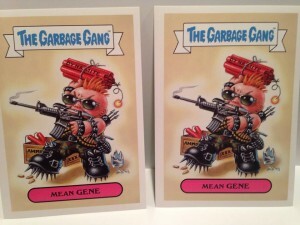 In the caption it says, “This is a sticker for Garbage Pail Kids 30th anniversary set and will be available at “Topps.com only”, there is A and B versions each sold with the two different versions of the “GPK 30th binder”. 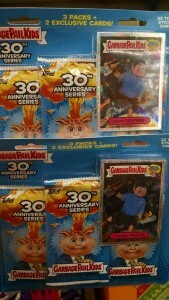 Release date is coming soon.” So does this mean we have new GPK binders incoming at topps.com? 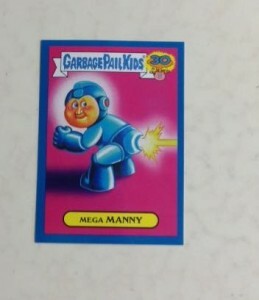 The website also mentioned under the Trekkie Travis card that there is a foil version available in special Wal-Mart packs of the 30th Garbage Pail Kids set. Has anyone spotted anything in Wal-Mart?